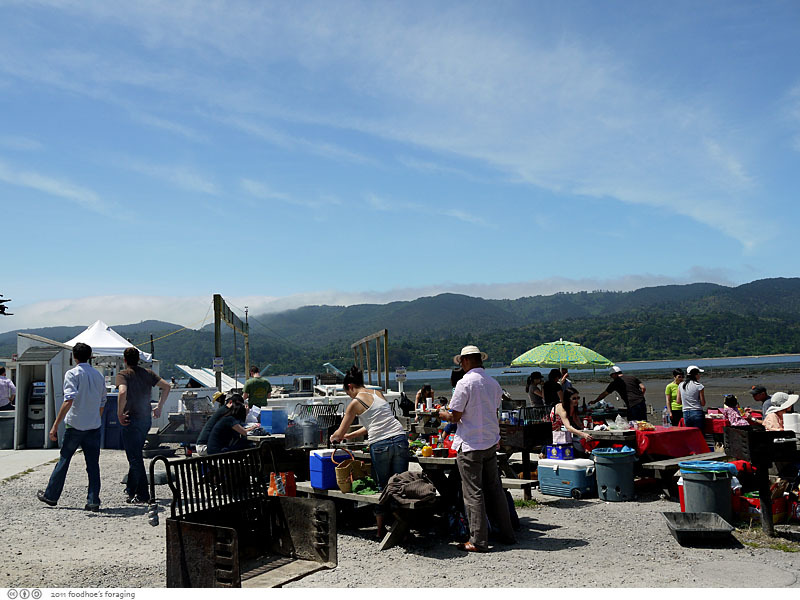 a splendiferous time at Tomales Bay Oyster Co. So we decided on meeting at Tomales Bay Oyster Co, which I’ve posted about before here, and is just down the road. They don’t charge for use of the tables, which are available first come first served, so you must get there early to beat the crowds. 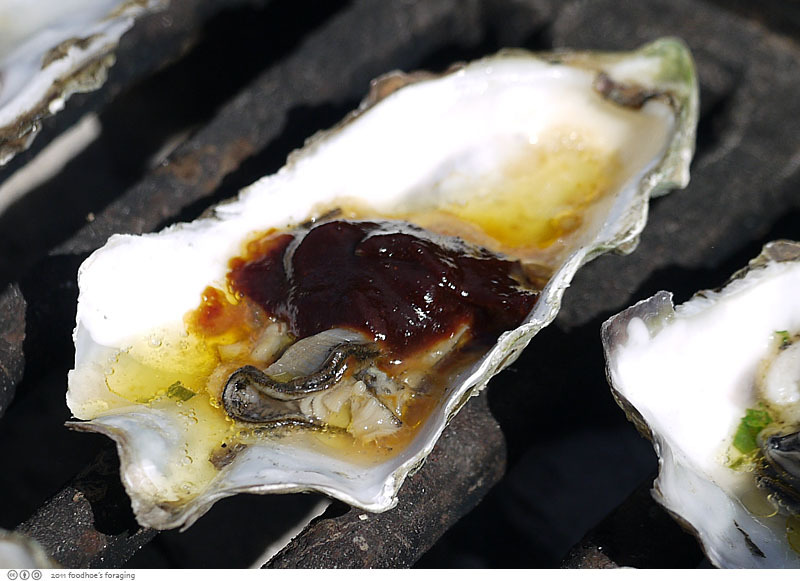 Tomales Bay Oysters is surprisingly large, with at least five separate areas filled with picnic tables and grills, most with excellent views of the bay. 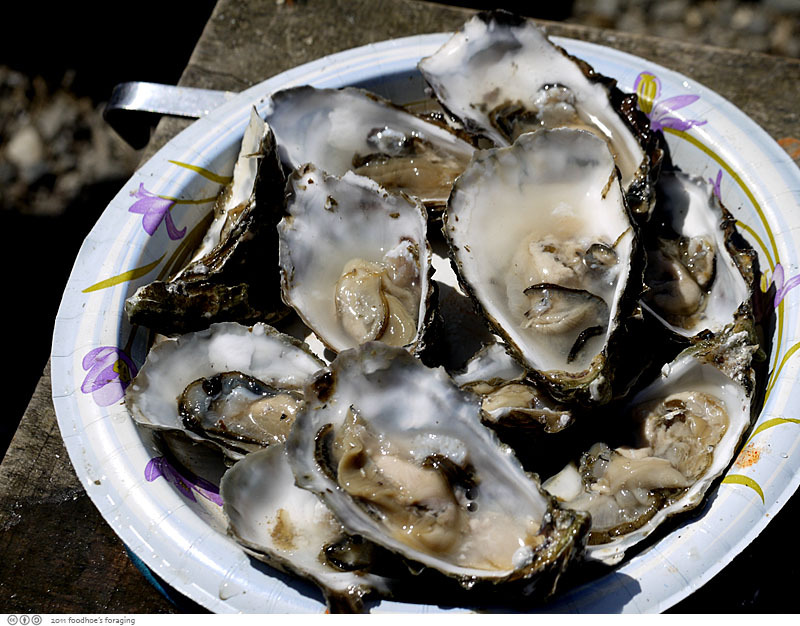 They specialize in fresh, farmed oysters as well as mussels and clams from the cool, clean waters of Tomales Bay (and the Pacific Northwest). 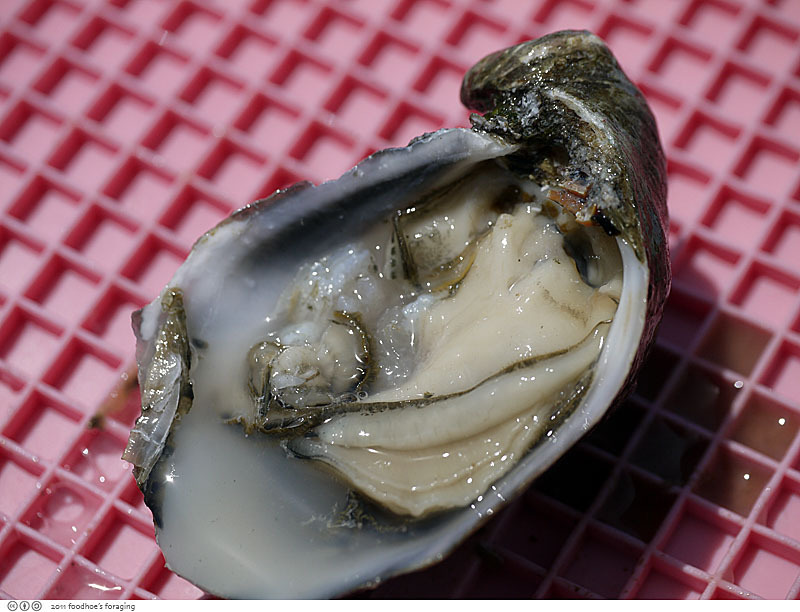 Here is our first oyster of the day, a fine kumamoto that Casey smuggled in from the competitor up the road. Mr. K and I love the baroque curves of the diminutive shells, the sweet, fresh, briny flavor and the crisp frilly flesh. An excellent way to start things off. Here is Brenann’s pile o’ meat wrapped up with some rice, kimchi and a good drizzling of the two sauces (the pungently spicy ssam sauce and the intoxicating ginger scallion sauce) in a butter lettuce leaf. He is pointing to the oyster in case you can’t see it. 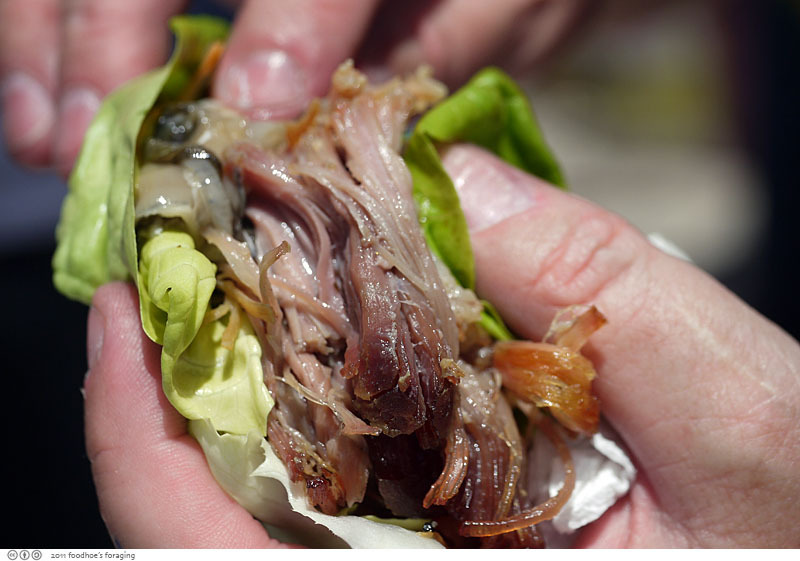 This one had an excellent oyster to pork ratio, the lettuce leaf was smallish and fit perfectly in my hand. I’m drooling just looking at the image which is indelibly burned forever on my tastebuds and my mind’s eye… is that the third eye? Whatever, it was unforgettable and delicious. 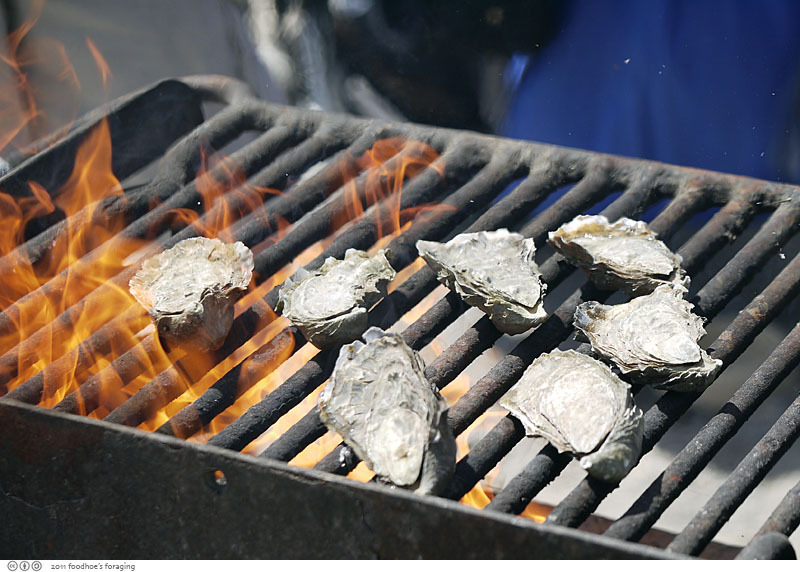 We tried placing the whole oysters directly on the grill, but found that they overcooked by the time that they popped open. So we entreated our shucking crew to carry on… I made an herb butter with garlic, lemon zest and fresh parsley and tarragon that is easy to spoon onto the oysters. 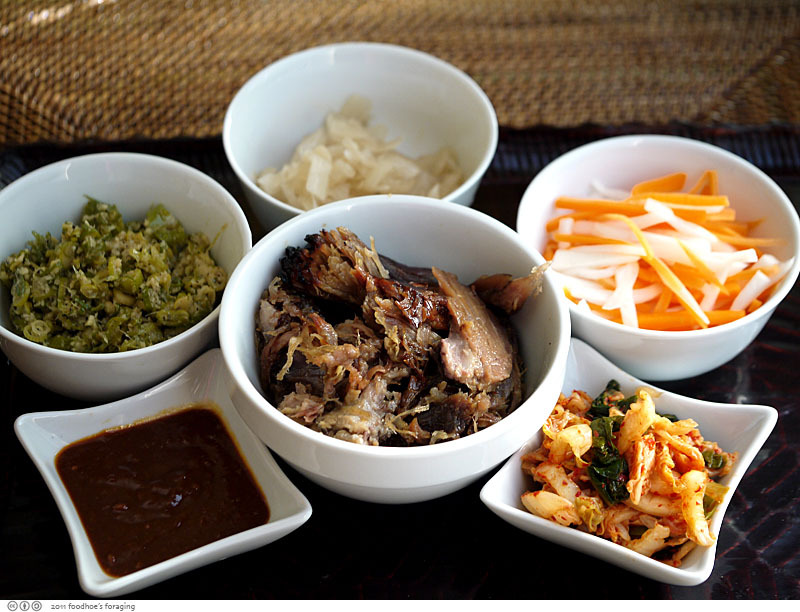 The thick mahogany sauce looks like bbq sauce, but it is actually the ssam sauce, which dominates your tastebuds in a deluge of fermented miso paste mixed with korean chili paste, sherry vinegar and grapeseed oil. We found it to be excellent combined with the garlicky herb butter. 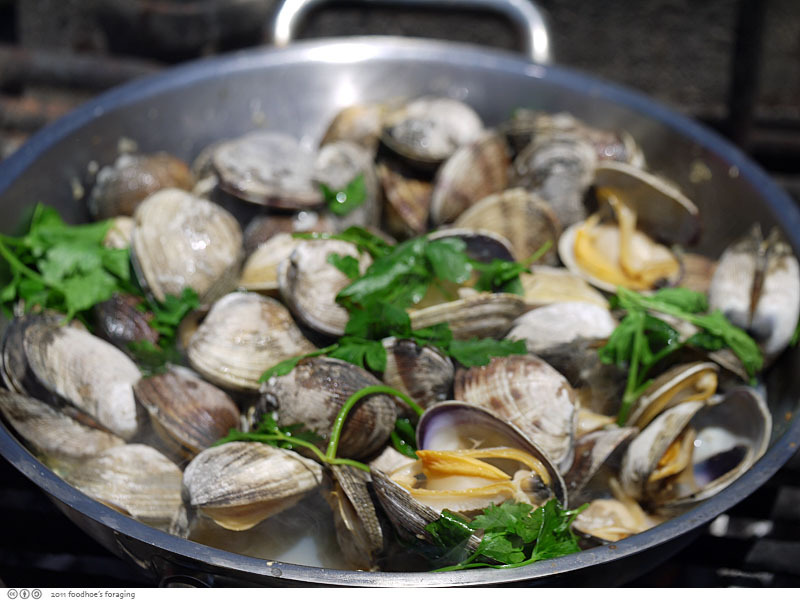 My famous steamed clams, made with garlic, olive oil, white wine and parsley and several bags of clams that we purchased from our hosts. It is simple and delicious, you can get the recipe here. 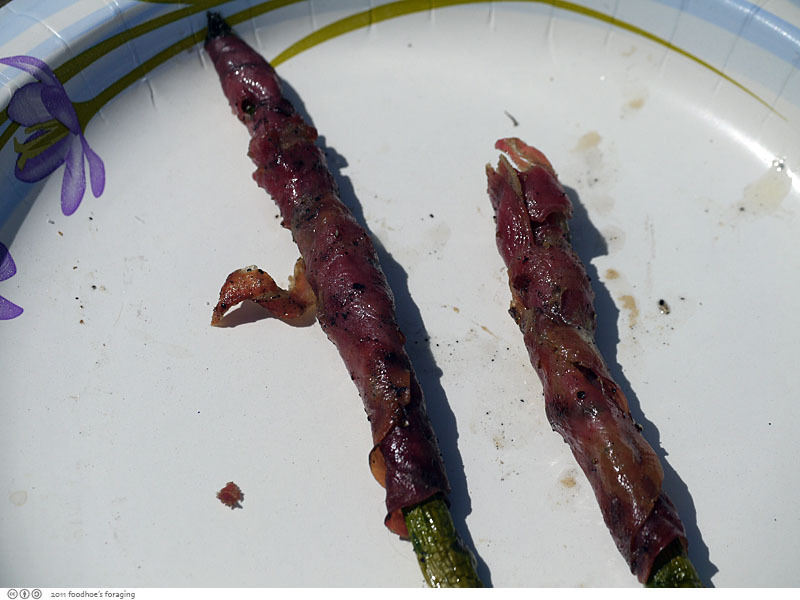 Kristina’s friend Alicia brought a bunch of asparagus that she wrapped with a paper thin slice of prosciutto and grilled until chewy and crisp. OMG this was absurdly delicious and addictive. I so loved these! 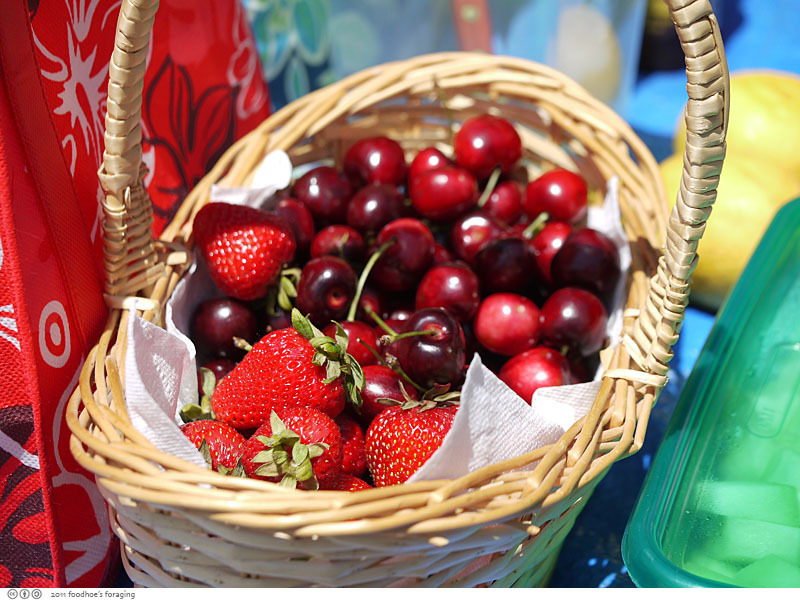 Suzywoo brought a bowlful of sweet summer bounty, a gorgeous array of pear and apple slices, grapes, strawberry, watermelon. Elizabeth brought a delectable rumcake that we fell upon like craven zombies. 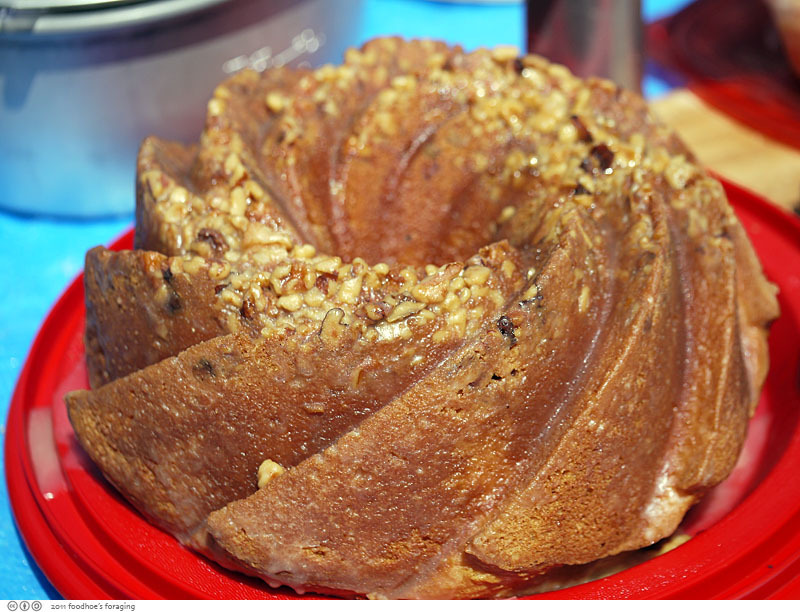 She said she made it with yellow cake mix, and it had a buttery crunchy nutty topping and sweet sticky icing too. There were countless other delectables: Cody brought the beloved Pain Epi from Acme Bread along with slices of Hobb’s wine cured salami, Kristina brought plates filled with gooey buttery cheese and Chris and Amy brought a special request from moi: a childhood favorite – onion dip made from sour cream and lipton’s onion soup mix which would be on the menu for my last meal ever… We ate very well, in fact, we feasted like gods. 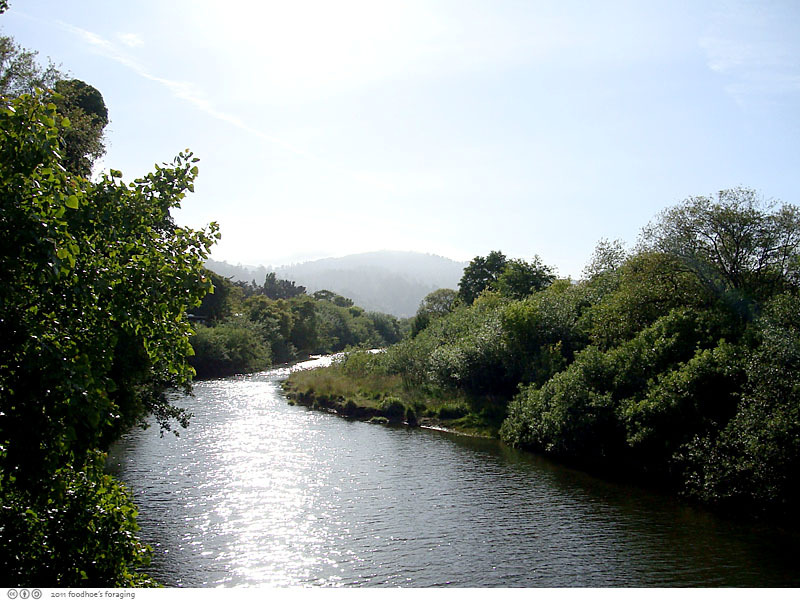 And this is a photo I took from a bridge in Point Reyes Station… it’s just too dang scenic! A beautifulo place! So great for picnics. I really love the wraps. Oh wow, looks like you lucked out on beautiful weekend weather for your oysterfest. And those oysters with the bo ssam looks crazy good! What a fun day! I love oysters! 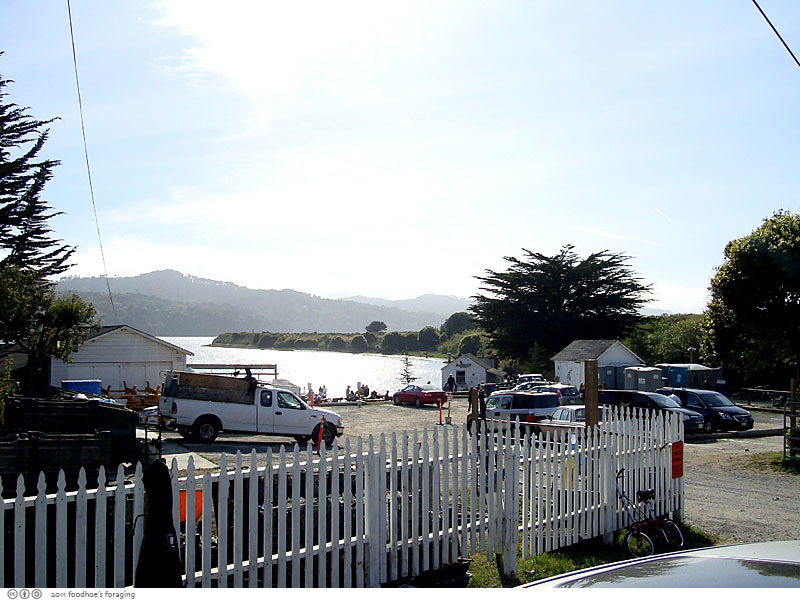 how early did you have to get to tomales bay? we’re hoping to make a trip there this saturday! Hi diane, thanks for visiting! We got there at 11:15ish and just missed out on the really good tables. So I’d try to get there before 11. 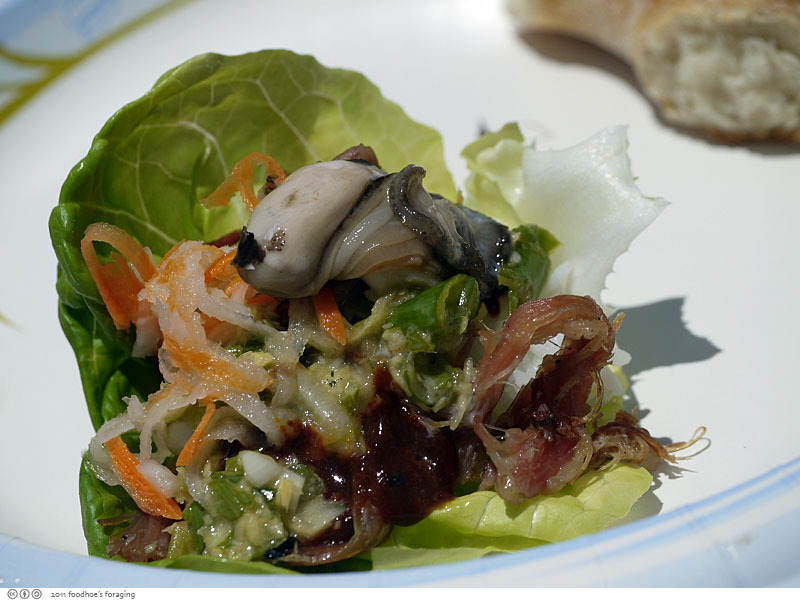 Bo ssam to bring to Tomales Bay? Incredible AND Smart! I love your style Foodhoe. What a beautiful day with friends and the view. 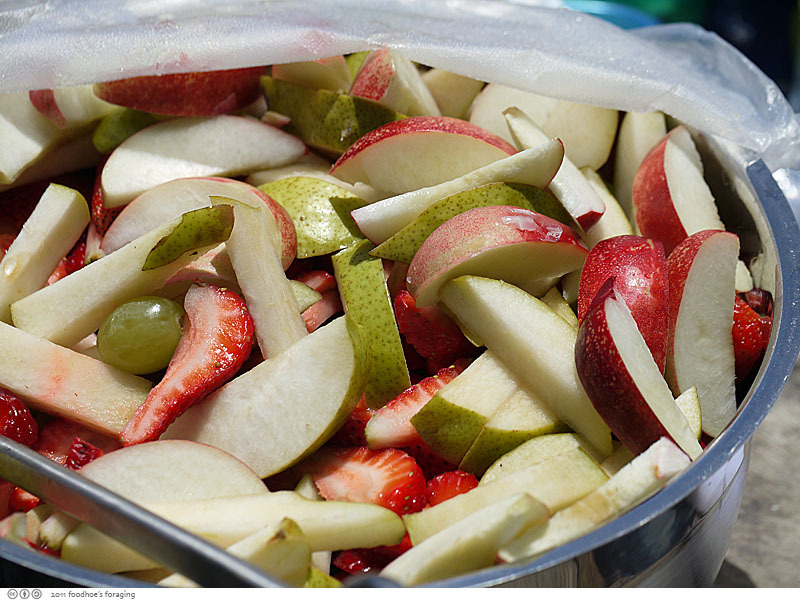 Oh my, what a feast!As always your photographs make me want to dive in. And now that I’m officially obsessed with David Chang, the idea of the surf and turf inspired by his cuisine kills me! Tomales bay oyster company is fantastic! Make sure to read the web page before going as big groups are not welcome. Also no bring seafood from other places! Eg hog island oysters. Love the photo and food ideas!